The following are descriptions of individual tracts. Please refer to the aerial photograph and maps above for further clarification, and to the cabins page for pictures and particulars of the cabins. 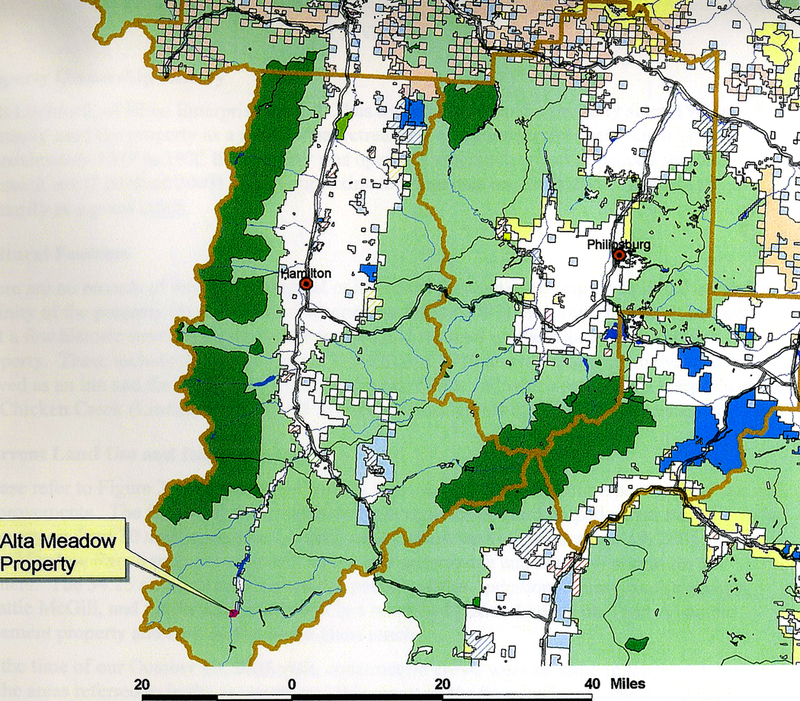 The image on the right illustrates Alta Meadow Ranch's location in relation to the surrounding wilderness. 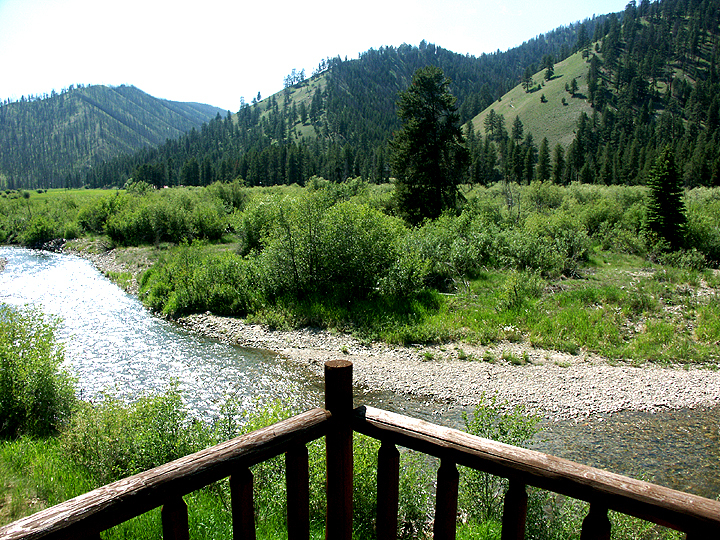 Alta Meadow Ranch is in the salient of Montana extending into Idaho's Selway-Bitterroot wilderness - the largest wilderness area in the lower 48 states. TRACT A consists of about 47 acres of meadow and forest. It is the site of the River Lodge, located near the bank of the West Fork of the Bitterroot River. The river forms the western boundary of this tract. To the north is a beautiful spruce grove overlooking a willowed flood plane which runs down to the river. This area is prime moose and elk habitat. The River Lodge has an underground propane tank and electrical hookup as well as an automated underground irrigation system for the lawn and landscaping. Conifers have been placed strategically to create more visual barrier to the road and the yard is full of beautiful Rocky Mountain Maples. This home has a dedicated electric generator in case of power outages. Property tax for this tract was $2,592.82 in 2009. TRACT B is not for sale at this time. TRACT C is about 37 acres of meadowland, willow groves and ponds. It abuts the West Fork of the Bitterroot River on the east and forest service land on the West. On its northwestern aspect are the Ranch House and adjacent garage/shop. 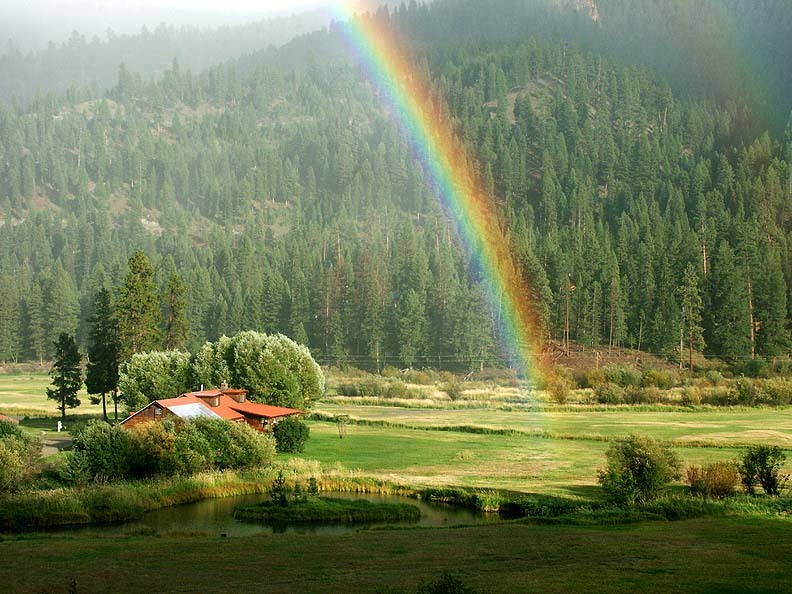 The Ranch House is oriented to the southwest and has a wonderful view of the meadow and mountains beyond. The electrical hookup is underground as is the irrigation system for the lawn and landscaping. The Ranch House has a dedicated backup generator. There is a detached garage/shop, half of which is insulated and heated. TRACT D is about 29 acres of meadow and willow groves - the site of three cabins, two of which are restored original buildings from 1900 and 1910. 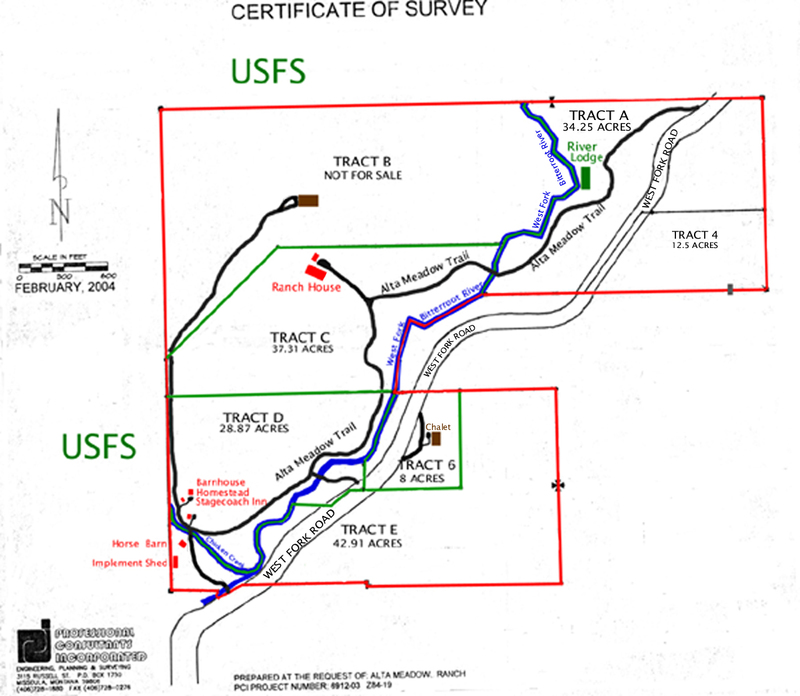 This tract abuts the West Fork of the Bitterroot River on the east, Chicken Creek on the south and forest service land on the west. There are excellent views from this property of the meadow and mountains to the north, south and west. The cabins are separated visually by an extensive landscaping project planted in the spring of 2002. The cabins share utilities and are serviced by a large backup diesel generator housed well away from the buildings. Utilities are underground as is the automated irrigation system for the lawns and trees. Recently the septic system was upgraded to accommodate six bedrooms, meaning that if an owner wishes to replace the Barn House, it would be possible to build a four bedroom house in its place. Property tax for Tract D was $2,215.37 in 2009. 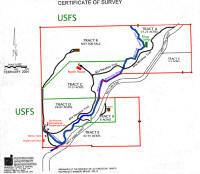 TRACT E is a 43-acre parcel south of Chicken Creek at its confluence with the West Fork of the Bitterroot River. The land west of the river is level and contains a horse barn with hay storage in the loft, 4 indoor stalls and 4 covered exterior stalls. The barn has electricity, a water well and a tack room. Adjacent to the barn is a large implement shed (3,000 SF) which is sufficiently tall to accept a bail wagon. Also there are three fenced pastures, one of which serves as a riding arena. The land on the east side of the river is quite steep and forested. Tract E is not for sale at this time, but all of the pastures, horse barn and several stalls in the implement shed are for lease to owners of other tracts at Alta Meadow Ranch for a nominal fee. 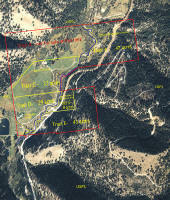 TRACT 6 is an 8-acre parcel on the hillside east of the river and road. 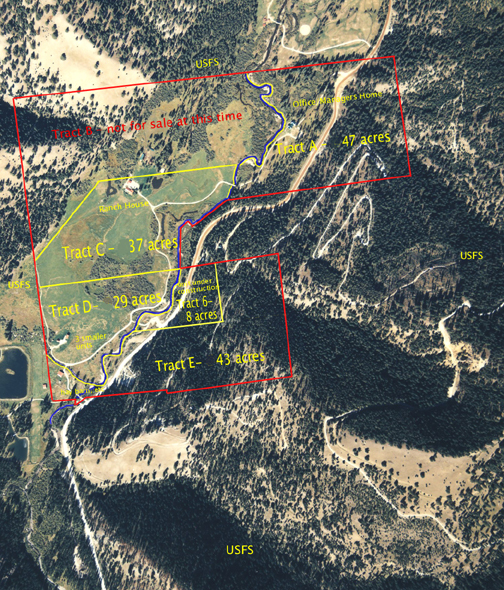 The West Fork of the Bitterroot River forms its western boundary and on the other three sides the land is forested, melding into Tract E on the south and east. A 2700 SF chalet-style home with two bedrooms and three bathrooms and a large "bonus room" has recently been completed. The surrounding land, being heavily forested and somewhat uneven, is unsuitable for further construction and fencing. 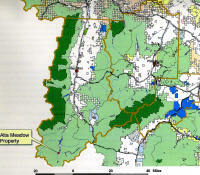 ALTA MEADOW RANCH WILL BE GOVERNED BY A HOME OWNERS ASSOCIATION. FOR MORE INFORMATION PLEASE CLICK HERE.